Tua, the Star Beam Fairy, opened her eyes. For some time already she had lain as one lies between sleep and waking on her rose petal bed, and it seemed to her that she heard the sounds of dancing stars, and of music that rippled across the galaxy from her far off home. She thought to herself that she had dreamed of riding on the tails of a comet and skipping on beams of sunlight. In fact, she was high above the earth and was looking down watching young girls playing all over this blue-green globe that had fascinated her for so long. It was many many years since she had seen the royal city of the Fairy Realm that was ruled by her father the Great Elf Suntouch and danced with other fairy princesses. It has been a long long time since she had seen her lovely mother, Queen of the Star Beam Fairies. Indeed, Tua, the Star Beam Fairy was a princess! She had traveled far to take her place in the heavens as she was no ordinary Fairy. She was a friend of the Stars. She was a sister to the Sun. 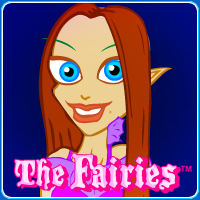 Come and Dress up Tua, the Star Beam Fairy, and watch her magical wings.